Is there really a need for another blog about cooking? This Cobb Salad is almost too pretty to eat. Almost. When the weather gets hot around here, as it usually does in DC during the summer, my family often requests the Big Salad for dinner. A Big Salad is, of course, a perfect summer meal, since it doesn’t require heating up the kitchen and you can pretty much throw anything you want into it. It is the summertime version of a casserole — all the little leftovers that are taking up space in your refrigerator can generally take up residence in a Big Salad just as you might use them up in a casserole: half a cup of shredded carrots, that Tupperware container that still has a few spoonfuls of tuna salad, a handful of toasted pine nuts, and so forth. Last night was the Home Run Derby, and through a roundabout route, I was inspired to make a salad to accompany this annual slugfest that takes place the night before the All-Star Game. I am a baseball fan; my dad is from Connecticut and raised me right — meaning that I follow the Red Sox. My husband and I were Baltimore Orioles fans for several years (okay, I admit that I rooted for Boston when they came to town) and had season tickets for all the Sunday games, but Cal Ripken’s retirement and the constant internal turmoil caused by owner Peter Angelos finally wore us out. We tried being Washington Nationals fans after DC finally got a team, but, honestly, they make it really hard to enjoy watching their games. Another error, another half-hearted run to first base, another phenom pitcher who doesn’t live up to the hype. The stadium vendors wear shirts that say “Eating is not a spectator sport” — likely referring to the fact that a lot of fans seem to spend more time lined up for half-smokes at the Ben’s Chili Bowl stand than actually watching the game — but, at Nationals Park, I’m not convinced that even the players would agree. Home Run Derby = Anaheim (where it was held this year) = California = Hollywood = Brown Derby Restaurant = Cobb Salad. 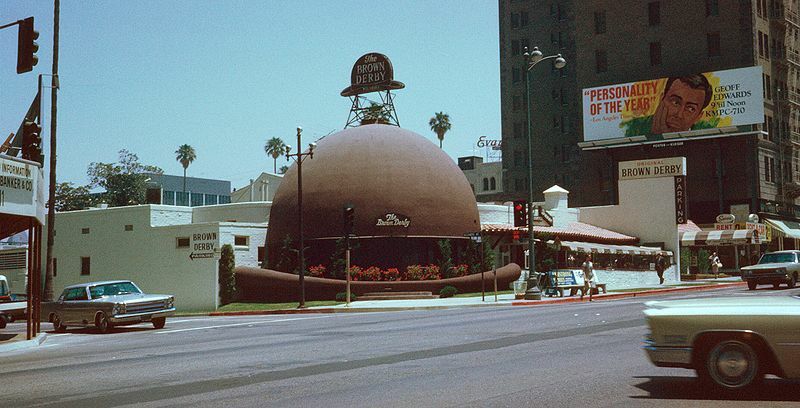 The Brown Derby Restaurant, early 1960s. Photograph by Chalmers Butterfield. The Cobb Salad was the signature dish of the Brown Derby Restaurant, a landmark of Hollywood during its glory days from the 1930s through the 50s. Sadly, the original restaurant is gone, but the salad still remains as a truly American creation, rumored to have been dished up out of bits and pieces from the kitchen by owner Robert Cobb in 1937 as a late-night snack for famed movie theater owner Sid Grauman. It features cold chicken, crumbled bacon, chopped tomatoes and avocado, and sometimes includes crumbled blue cheese and chopped black olives. I chose to make the classic version which includes a really wonderful blue cheese dressing made with a red wine vinegar base. Not unlike a good baseball game, the key to the Cobb is layers. When you order it in a restaurant, it should arrive with each ingredient lined up across a bed of lettuce. You can then choose to mix it all up together or savor each flavor independently. A Cobb Salad is a team of individuals — together they can form a perfect amalgamation of flavors, but they can also each stand alone if necessary, supporting each other and enhancing the overall result. A classic salad is the perfect metaphor for really good baseball. 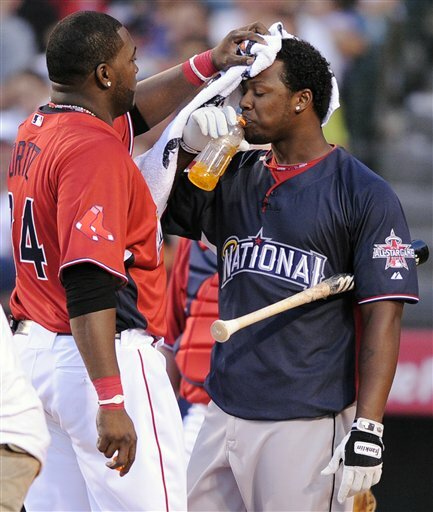 Big Papi encourages Ramirez to cool off in between swings at the Home Run Derby. Of course, it may have just been a diversionary tactic — if it was, it worked. Last night’s Home Run Derby was a big night for Big Papi — David Ortiz, the 34-year-old designated hitter for the Boston Red Sox. Ortiz had a tough season in 2009 and people had pretty much written him off for this year, but he seems to be back in form, with 18 homers so far this season and 57 RBIs; he became the first Boston player to win the Derby, hitting 32 long balls in Angel Stadium. The best part of the Derby, however, was probably the display between Ortiz and his closest rival of the night, Hanley Ramirez, a 26-year-old fellow Dominican who was briefly with the Red Sox before being traded to the Florida Marlins. He openly considers Ortiz to be his mentor and their supportive relationship was clearly evident as they cheered each other on during their at-bats. If the Red Sox and the Marlins were to square up against each other in a World Series, there is no doubt that Ortiz and Ramirez would be fierce competitors, but they’d probably go out together for a salad afterwards. We generally don’t think of avocado and chicken as ingredients that fit together and they rarely share the same plate other than when part of a Mexican menu. But, somehow, within the confines of the Cobb Salad, they are logical, even perfect, companions, the mild flavor of the chicken balanced against the subtle nuttiness of the avocado. Add in the smokiness of the bacon, the sweet tang of tomato, and the sharp bite of the blue cheese, and you have a group of individual flavors that should not fit together in a logical way, yet add up to a mouthful of Utopian delight. If you have ever loved the Red Sox, or the Cubs, or the Mets — have a Cobb. It’ll make perfect sense to you. 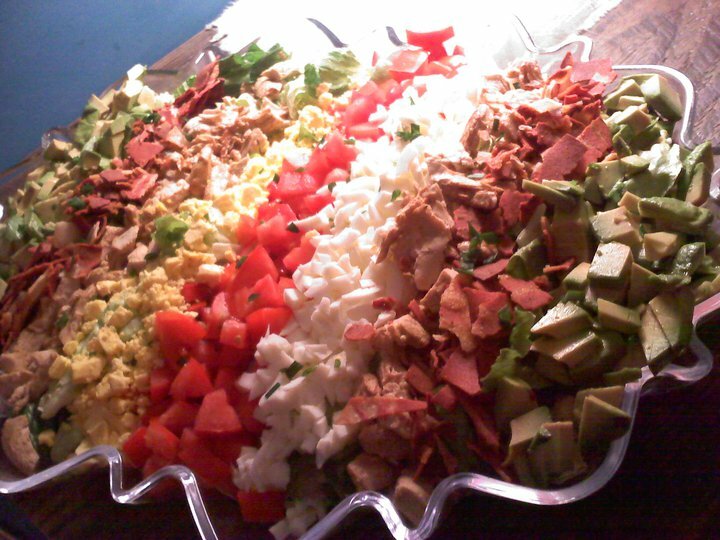 Here’s a link for the perfect Cobb Salad recipe — it takes a little time to assemble but is worth the effort.